Resembling the red seeds of pomegranate, this gemstone receives its name from the 14th Century Middle English word ‘’gernet’’ meaning dark red. These beautiful stones come in variations of colours, the most common remaining dark rich red ranging to deep violet-red. Especially durable gemstones, found all over the world, including Wyoming, Czech Republic, Greece, Russia, Tanzania, Madagascar, Sri Lanka and India. Garnet symbolizes truth and faith, these gemstones were thought to keep the wearer safe during travels, protecting them from accidents far from home and having the abilities to protect their owners from nightmares. The garnet also symbolizes deep and lasting friendships. Give the Garnet to someone whose friendship you deeply value. The Garnet was even praised for its healing powers and it is said to have healing properties for the heart and lungs. Browse through our collection of Garnet jewelry and choose the perfect gift for those who share January birthday, sending them wishes for goodwill, happiness and health. Quartz mineral species, Amethysts vary in their purple color from reddish purple to fair grayish violet. The word ‘’amethystos’’ comes from Greek, meaning ‘’not drunk’’, and as the purple color resembled wine, it is no coincidence that ‘’methy’’ is a word for wine as well. Amethysts are found widely around the world, including across the USA, Mexico, Brazil, Canada, Africa, Italy, Germany and Russia. Amethyst, demonstrating the drama and excitement with its exceptional color, is an easily recognizable gem. The ancient wearers believed it could protect them from drunkenness and intoxication. Nowadays these striking stones are associated with stability, peace, balance, sincerity and a calm disposition. It was also used as medication in the Middle Ages, to dispel sleep and sharpen intellect and they are still reputed to be effective for healing withdrawal symptoms of any sort of addictions, headaches, insomnia and for general healing. Check our collection of Amethyst jewelry offers, not only for those who were born in the month of February but make it as a gift, providing the extra warmth, strength and courage. Gemstones indicated by their cool tranquil colors, as if you were wearing a piece of wave from the ocean, bearing the meaning of seawater in the name itself. It was even believed that the Aquamarines come from the caskets of sirens, washed to the shore. These bright colored gemstones, can be found in Brazil, China, Colombia, Russia, India and United States. Owing to their association to the sea, Aquamarines were sacred stones to the sailors, promising them a secure voyage. Due to their soothing color they are believed to bring calmness and peace to the wearer. Romans believed that Aquamarine jewelry could help to reconcile with the enemies, some believed these stones are able to re-awaken love between people. Aquamarines due to their calming effect are still believed to be helpful for the mental health and to cultivate the inner tranquility. In ancient times, these gemstones were used to cure any infection, and were considered powerful for healing the eye ailments. Jewelry with Aquamarines will be a nice gift not only for those born in March but to use the Aquamarine as a gift to the bride as it symbolizes long unity and love. Lucky ones born in April can call the most prized gemstone - diamond, their birthstone. From the Greek word ‘’adamas’’, meaning invincible, the diamond truly deserves this title. The hardest and most durable stone, accordingly stands as a symbol for the everlasting love. These gemstones are also special for their wide range of colours, from the most widely known crystal white, to the very dark black ones. Diamonds nowadays are primarily mined in South Africa, India, Brazil, Canada and Australia. Diamonds were valued since the ancient times, as even before 400 B.C. Sanskrit texts are already mentioning the wonderment with these crystals. Many legends have been associated to these gemstones, it was believed that diamonds were created by lightning bolts that struck the Earth, Greeks believed that diamonds were the tears of the Gods or splinters from stars. Due to all the legends about the diamonds, their sparkling fire and brilliance, they were believed to have magical powers. The stone represents faith, loyalty, honesty, purity and love. 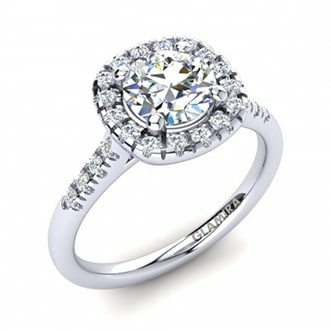 This is the reason why diamonds are widely chosen for the engagement rings as well. These gemstones were thought to have extraordinary healing powers, curing illnesses related to the brain, and because of the purity associated with them they were capable of drawing out any poison from the body. Providing the strength, magnificence of the diamond and the symbol of the everlasting love to those not only born in April but to your beloved ones as well. With its bright green colour, Emerald could be called the symbol of spring and thus it is not surprising that it is the main birthstone for those born in May, with the green of nature being so striking. With their vivid colours, the more intense its green colour is, the more valuable is the Emerald, sometimes even exhibiting a bluish tinge. Name for Emeralds indirectly came from the Greek word ‘’smaragdos’’ which was a name for several kinds of green stones. These stones can be found in Colombia, Brazil, Pakistan, Russia, Australia, South Africa, India, Norway and the United States. Emeralds with their deep green color symbolizes the renewal of life and possesses features to impart in your life such as faithfulness, loyalty and friendship. There are many myths told about the Emerald. The Romans associated Emeralds with goddess Venus, who represented fertility, goodness and beauty. For their healing powers, they were believed to prevent epilepsy, to stop the bleeding and to lower down the fever. Give the present of all bright spring colors to your loved ones born in May with the sparkling deep green Emerald stones. The only gemstones created by living creatures,-oysters and clams, pearls make those born in June lucky to have an exceptional birthstone. Varying from the most widely found white to rarer black, pearls are marvelous gifts from the oceans. Name for pearls derives from a Latin word “perna”, which means “leg” because of the opened mollusk shell’s resemblance to the mutton leg. Pearls nowadays mostly come from Japan, China, Australia, Philippines and Indonesia. Pearls were highly valued since the times of Ancient Egypt. Since then, legends and myths have started, calling these gemstones teardrops from the moon, capable of bringing charity, innocence and faith. They are believed to have healing powers, curing many different diseases and even insanity. Pearls, up to this day are used as medicine in Asia. 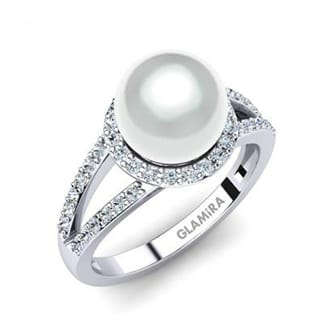 Pearls, the symbols of purity, can be the best choice for the engagement rings to demonstrate the purest of the feelings you have for your beloved. Once called the “glowing stone” in Ancient Asian stories, rubies not accidentally belong to those born in July, as if bringing the heat of summer. Name for the rubies, came from the Latin word “ruber”, meaning red. Being one of the four precious stones, rubies have their value measured by the color, among other things. The brighter, “bloodier” the ruby is, the more valuable the gemstone will be. Their extraordinary color and the hardness, yielding only to the diamond, make rubies one the most desired precious stones worldwide. Rubies can be obtained in Burma, Sri Lanka, United States, India, Australia, Pakistan, Nepal, Afghanistan, Brazil, Myanmar and Thailand. Due to their fiery red color, rubies have become symbols of passion, enhancing courage, energy and protecting the wearers from disputes and harmful thoughts. They are associated with the vitality, courage and the force of life, bringing success in love. For all of these reasons, rubies are perfect for the engagement rings to display the glowing strength of your passionate love. Among the oldest gemstones known to people, Peridot is the stone for those born in August. The symbol of sun, Peridot, brings the bright green color to the last month of summer. Peridots are one of the stones, which do not come in different colors but they do vary in their brightness of green, from olive green to the darker, brownish hue. Peridots are found in Brazil, Burma, Australia, Kenya, Mexico and Sri Lanka. The origin of the name for Peridot is not completely clear, but is thought to derive from Greek word “peridona”, meaning “giving plenty” The gemstone carries this meaning to this day, as it is believed that Peridot brings prosperity and good fortune. Due to the mentioned symbolism of the sun, Peridots are said to help with depression, lower down the amount of stress and reduce negative emotions, get rid of the toxins from the body, and even to be helpful for the hair, skin and nails. Peridot is not only the perfect gift for the those born in August to bring them prosperity and summer glow, but it is also perfect for the engagement ring as they are said to make all human relationships and marital life more harmonized. Popular since the Middle Ages, Sapphires are gemstones for those born in September. These gemstones come in quite a few different colors, but they are most famous for being rich bright blue. Even the name for them comes from several ancient languages but one of the main explanations is the Latin “sapphirus” , meaning “blue”. Sapphires are found in India, Myanmar, Thailand, Vietnam, Sri Lanka, China, Australia, Brazil, Africa and North America. Due to the soothing powers of the color blue, Sapphires are believed to bring peace, harmony, and help focus your mind. Since the Middle Ages they are believed to reinforce wisdom. They symbolize sincerity, faithfulness and loyalty and for this reason, jewelry with the sapphires would not only be the perfect gifts for those born in September, but can be set as a perfect engagement ring, capable to demonstrate how exceptional your love is. The Sapphire was even the gemstone used for princess Diana’s engagement ring, which proves the royalty this stone carries! Tourmalines come in various shades and colors, but the bright shiny pink Tourmaline is the one dedicated to the month of October. Generally, the name means “stone of mixed colors’’, and comes from Sinhalese word “‘tura mali”. Maybe because of their color, pink tourmaline is associated with Heart Chakra and it is said to open the hearts to unconditional love. Pink Tourmalines can be found in Brazil, Sri Lanka, Nigeria, Mozambique, Madagascar, Afghanistan, Pakistan and the United States. Many legends surround this gemstone. In the ancient times, tourmalines were believed to provide magical protection against evil and it is said to be the stone containing most metaphysical powers. Pink tourmaline is believed until this day to be able to sooth, reduce anxiety and stress. Giving as a gift for those born in October, pink Tourmaline will show how much you cherish the person. Show the compassion, tenderness and how strong your love is with the pink Tourmaline gemstone. As if to bring light and warmth during this cold month, Citrine with its bright colors became the stone for November. The name for the stone is quite self explanatory, for the Citrine reminds of a precious solid citrus fruit. These stones can be obtained in Brazil, Bolivia, Africa and Russia. Legends say that the Citrine stone is capable of opening your mind and thus even boosting your psychic powers. They are still believed to have healing and soothing powers, to relieve anxiety, nervousness and make your everyday life less stressful. Supposedly for the color of this bright stone, Citrines are associated with cheerfulness and joy, providing the wearers more hope and strength in difficult situations. Citrine will be the best choice for a gift not only for those born in November, give this cheerful stone and bring some smiles to your beloved ones faces! People born in December have an exceptional stone dedicated for them. Tanzanite is one of the most recently discovered gemstones. With its relatively modern history, Tanzanite nevertheless has already earned fascination and admiration for its bright deep blue color. These gemstones are quite rare and one of the few places that could be called lucky to have them is an area in Tanzania. Since Tanzanite is quite new historically, legends and myths do not yet surround them. However,Tanzanites were noticed by Tiffany & Co, which gave the name to the stone due to its place of origin and popularized it worldwide, making Tanzanite one of the most coveted gemstones nowadays. Jewelry with Tanzanite would be the best gift not only for those born in December, but to everybody you cherish. Give a gemstone which will definitely create and change the history of jewelry!